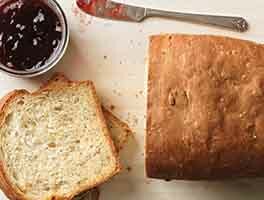 This sandwich loaf, with its hint of sweetness from both honey and oats, is wonderfully moist and tender. And, since it bakes in a pain de mie pan (pullman loaf pan), each slice is beautifully shaped, with an ultra-thin crust — ideal for kids. 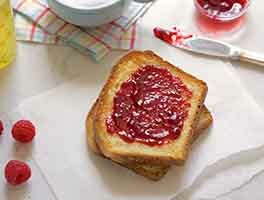 It slices easily for sandwiches and toast; try it in French toast for a tasty twist on that breakfast favorite. 2 hrs 50 mins. to 4 hrs 5 mins. *Use the smaller amount in the summer, or in a humid climate; the larger in winter, or in a drier climate. Combine all of the ingredients, and mix until cohesive. Cover the bowl, and let the dough rest for 20 minutes, to give the oats a chance to absorb some of the liquid. Then knead — by hand, stand mixer, or bread machine — to make a smooth, soft, elastic dough. Place the dough in a lightly greased bowl, or in an 8-cup measure (so you can track its progress as it rises), and let it rise for 1 to 1 1/2 hours, until it's risen noticeably. It won't necessarily double in bulk. Gently deflate the dough, and shape it into a 9" log. Place the log in a lightly greased 9" pain de mie (pullman) pan, pressing it gently to flatten. Place the lid on the pan (or cover with plastic wrap, for a better view), and let the dough rise until it's about 1" below the top of the pan/lid, 60 to 90 minutes. Towards the end of the rising time, preheat the oven to 350°F. Remove the plastic (if you've used it), slide the pan's lid completely closed, and bake the bread for 30 minutes. Remove the lid, and bake for an additional 5 minutes, or until an instant-read thermometer inserted into the center registers at least 190°F. Remove the bread from the oven, and turn it out of the pan onto a rack. Run a stick of butter over the top, if desired; this will yield a soft, buttery crust. Cool completely before cutting; wrap airtight and store for several days at room temperature. 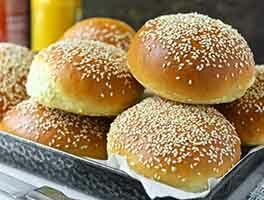 Can you make this without a pain de mie pan? Yes. Simply bake it in a 9" x 5" loaf pan instead of a pain de mie pan. 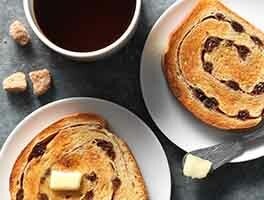 How about making this recipe in a standard (13" x 4") pain de mie pan? Increase all the ingredients except the yeast by 50%; leave the yeast as is. Bake the bread for about 35 minutes with the lid on, and 8 to 10 minutes with the lid removed. Great flavor amd texture. Next time ill do the bigger loaf. Skipped the.butter baste. Next time plan to add the water needed as hot watee to the oats so they absorb it better, let em rest until warm and then add to mix. Ty KAF! 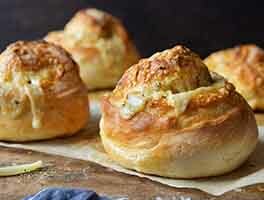 This is a terrific recipe that I've baked many times. Just one word of warning. In my experience, the 2nd rise moves MUCH more quickly than the instructions indicate so it's very easy to end up with bread "leaking" out around the Pullman lid after you start the bake. Just watch it closely. It's really great bread and well worth that small hassle. I baked this in a standard loaf pan since I do not have a pan de mie pan. It turned out very well. The bread had a great flavor and cut well for sandwiches. I will definitely make this again. I followed the recipe carefully and it turned out excellent. A new favorite! Just made this and it was delicious! Can I use whole wheat flour for this? Wonderful loaf of bread - but I think the Pullman loaf pan has something to do with this, too. Question: Taking the temp with a probe thermometer leaves a visible hole in some slices. Will an IR thermometer show the internal temp or just the temp of the crust? If so, can I "fudge" the results by adding a number of degrees to approximate the internal temp of the loaf? 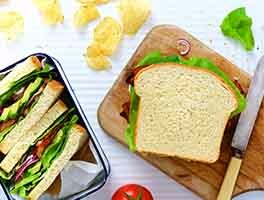 Great simple sandwich loaf. Mine was just short of fully filling the pullman pan - I had a slightly domed top rather than the usual sharp corners. Regardless, this had a terrific crumb, was very soft and light. Flavor was slightly sweet and buttery, with a little texture from the oats. Will certainly make this again, perhaps with a little whole wheat flour in the mix. oh my goodness! So easy, simple, and quick! I started at 7:30-ish and had fresh bread by 11!!!!! My house stays around 77 degrees F, so that's part of the reason why. Kneaded by hand. It started out sticky, but I didn't add any extra flour, and it became glossier by the time the gluten was developed. I followed the directions for increasing for 13 x 4 x 4 pans, but used less yeast than the recipe originally calls for and less salt. INCREDIBLE! Better than any oatmeal bread from the store! This will definitely be a mainstay! Hi team, can we use oats flour here instead of the rolled oats? What changes would I need to make in the method? WarriorMomma from Newmarket ON Canada. This bread is so yummy!! Very easy to make. Next time, I will put the lid on for the final rise to try to get the sharp corners - I used plastic wrap to watch the rise but it got fatter in the middle and not the corners. Will definitely make this again and again.